API 512C Mic / Line/ Di Pre amplifier. 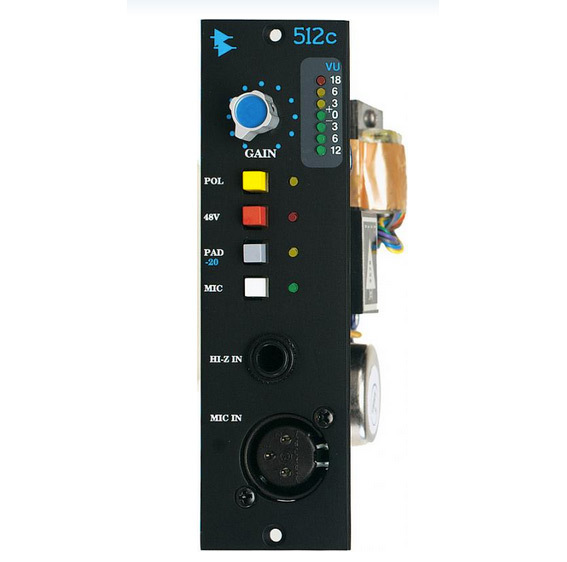 500 series fully discrete microphone pre amp with the much loved and unique API tone, 65dB gain, 48V, unbalanced line in (20 Kohm imp) great for synths, front panel hi Z in [400 Kohm imp] , -20 db pad which also changes the line in/Hi Z input impedance, phase reverse, front or back panel mic input, full metering. As used on countless great sounding hit records across all genres of music for decades. +4 balanced output. Made in USA . “The 512C has the clearest and sweetest tone, with enormous detail, dynamics and tonal enhancement, yet somehow, the signal remains remarkably uncoloured. These are still my all time favourite mic preamps”. George Shilling – Resolution Magazine. July 2004. API 512C always on demonstration at THE STUDIO SHOP !